Poker in Wisconsin is going strong, which was evidenced by last weekend’s Mid-States Poker Tour Potawatomi in Milwaukee. The tour, which was visiting the property for a second time, set a state record for largest turnout as 635 entrants created a prize pool more than triple the $200,000 guarantee. As a Badger, I was excited to take a shot in the state’s premiere event. In preparation for the tournament, I opted to sell some action. The MSPT allows players to enter a maximum of four times (only one reentry is allowed per starting flight up through Level 9), but I don’t like to get in for more than two (one for each day). As such, I budgeted for two $1,100 bullets and ended up selling half my action to seven different investors — some bought 5% for $110, while one did 25% for $550. For what it’s worth, I don’t charge markup (I have a hard time charging people for doing me a favor). I was ready and raring to go on Day 1a, but my enthusiasm quickly dwindled during the long grind, which saw me repeatedly look down at lackluster cards. I never got anything going in the first starting flight, eventually shoving my last 12 big blinds holding only to run into an opponent’s pocket tens. A on the flop was all she wrote for my first bullet, but there was still Saturday’s Day 1b. 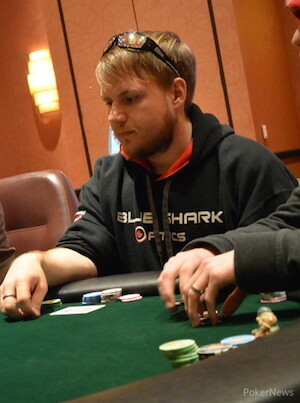 I got a good night’s sleep and returned to the casino to discover I’d drawn a fairly tough table that included Nick Revello, World Series of Poker Circuit and Heartland Poker Tour champ Bob Chow, and Daniel Goepel who went on to finish seventh in the tournament for $22,427. It was tough going, but I held my own until a big hand derailed me. It happened with the blinds at 100/200/25 when Chow opened for 550 from early position and another player called. Action folded to me in the big blind and I opted to flat with . I could have raised, but I decided to disguise the strength of my hand while out of position. It looked like it was going to pay off, too, when the flop came down to give me top set. I checked, Chow continued for 1,025, and the third player folded. At this point I had two choices — either to call or to check-raise. Again, I wanted to disguise the strength of my hand, and the best way to do that was just to call. I was hoping Chow held a big pocket pair and felt I’d only hit a small part of the flop. After the dealer burned and turned the , I checked for a second time and Chow bet roughly 1,600. With two hearts and some straight cards on the board, I knew it was time for a check-raise, which I did to the tune of 4,000. Chow thought for a few moments and did exactly what I wanted, moving all in for 13,450. 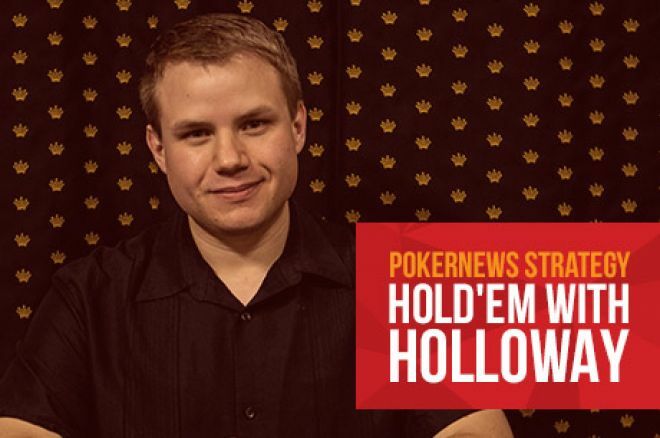 I figured him for either a big pocket pair or a small set, and I snap-called to discover the bad news — Chow had raised preflop with and turned a straight. I still had a chance to win the large pot and knock out a tough opponent, but the board failed to pair as the blanked on the river. It sucked, but to be honest I wasn’t that upset. The hand played out exactly as I’d hoped, and really, how could I have expected Chow to roll over that hand? Kudos to him for playing it the way he did, which evidenced the power of suited connectors early in a tournament. I think a lot of players get upset when they don’t get their desired result, but in hands like the one above, there’s no need to let it tilt you. It’s like getting it in preflop holding pocket aces against a single opponent. Sure, it hurts when you lose, but what else were you going to do? Of course you’re going to play it the same way each and every time. More times than not you’re going to win, but occasionally you will lose. Call it karma, destiny, or math; it’s bound to happen. Know that, accept that, and try your best not to let it affect you. I was left with 9,000 after the hand, but that dwindled until I shoved my last 12 big blinds holding only to run into (sound familiar?). I was extremely disappointed to be out of such a massive field, one that would award the eventual winner nearly $150K. I’d had a profitable cash session earlier in the day, and I thought about firing a third bullet. The only thing holding me back was that I had sold action. How would it look if I fired a third bullet on my own dime and shipped it? That was not a conversation I wanted to have, but the urge to fire again was strong. The only way I could justify reentering was to reach out to my investors, inform them of the situation, and get their blessing. That’s just what I did, too. I reached out to each of them and told them of my plan to fire a third bullet. I welcomed them to buy another piece if they saw fit (a few did and for that I’m grateful), but in no way was it expected. Fortunately my investors understood and gave me their blessing to fire again. The third bullet turned out to be my best (I worked my stack all the way up to 90,000), but ultimately it didn’t make a difference as a horrible level saw me fall with about an hour left in Day 1b. With that, my MSPT Potawatomi Main Event officially came to an end. The point of my “third-bullet story” is not to demonstrate how much of a degenerate I can be (though I know it did), but to show that when you sell action you have a responsibility to your investors. It’s imperative that you take that into consideration. Reputation is everything in the poker world, so do right by the people who do right by you. In the end, Fitchburg’s Jason Mirza emerged victorious to capture the $147,529 first-place prize. Mirza and I actually run in the same poker circles, and I was ecstatic to see him finally break through. It was a job well done and very much deserved. As for me, I will once again be selling action for an event at the end of the month — the Poker Night in America $25/$50 cash game at SugarHouse Casino in Philadelphia. It’s the biggest shot I’ve ever taken, and I look forward to writing extensively about it in upcoming “Hold’em with Holloway” installments.